"Arthur Schopenhauer once said that architecture is frozen music. 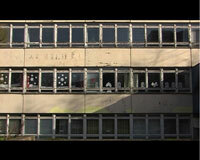 There seems to be a relationship between architecture and music" -are the first words of this essayistic short film. A female narrator talks about the connection between architecture and music. There is talk about certain music genres, portable mp3-players, modern industrial society, architectural history, sound art and acoustics. But in the end, it all comes down to film. 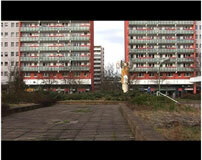 For the visualization pictures, cut rhythmically to a ratio of 5:4, of concrete-slab-buildings (in Berlin) are shown. The 5/4 meter is regularly used in Jazz. This implies two possible references. On one hand, there is a strong connection between Jazz and modern cities. The origin of concrete-slab-buildings can be found, amongst others, in the art and architecture of "Bauhaus". On the other hand, the 5/4 meter also implies a connection to film-history for the first sound film in history was "The Jazzsinger" (1924), a Yiddish Musical, which deals with the conflict between tradition and modernity by means of a father-son relationship. 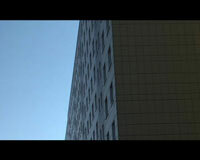 The sound, composed by Manuel Knapp, is woven into the audio and visual structure and results in an even stronger connection between the two. 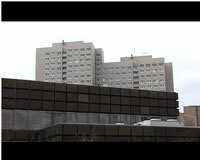 This film was part of the project Schallplatte-Plattenbau.